...Not in our house. Not for as long as I remember. We are a very traditional family, at least where holidays are concerned. My mother's family emigrated from England in the 50's, though bringing Anglo traditions to Anglo-Canada was a bit like taking coals to Newcastle back then. 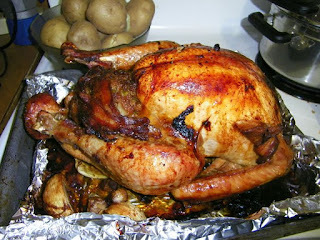 The biggest change in the traditional meal was switching from goose to turkey. Christmas was spent with my mother's sister's family in Beaconsfield, Quebec. We'd make the seven to ten hour drive from Toronto every year in a car laden with presents, potables and comestibles for the holiday. We left a house which never got decorated beyond a few coloured lights in the window and arrived to place where the halls were decked along with every other room in the house. Decorations notwithstanding, my aunt always said it wasn't Christmas until we arrived. Besides the turkey, stuffed with dressing my mother always made, there were always peas and corn, roast and mashed potatoes and gravy which I got to make under the supervision of my aunt, I was also the tea maker. My sister and younger cousins had the job of setting the table. I don't remember my older cousin being in the kitchen much. I think this was because they were always busy with the last minute wrapping of tree presents. Dessert was my aunt's specialty. She made fruit pies and mince tarts, shortbread and iced sugar cookies, two kinds of Christmas cake with marzipan and royal icing and, of course, the figgy pudding. The cakes didn't come out until tea time, however. That's when we gathered in our Christmas finery and exchanged tree presents. Up until then, from opening stocking to Christmas dinner, a significant number of us stayed in pyjamas. On Boxing Day we always had cold turkey, hot fries, salad and bubble and squeak, the traditional English answer to "what do we do with all this left over veg?" For dinner we always had tortiere, a traditional French Canadian meat pie made by my aunt's traditional French Canadian cleaning lady, Rose. A lot of the traditions I grew up with had to be adapted when I began to host our holiday meal. For one thing, I wasn't feeding as many as my aunt did. I'm not the baker my aunt was and neither is the one baker in the family. He's very good, don't get me wrong, but has a different repertoire which does not include mince tarts or fruit cake. We still open stockings first thing, but first thing is around noon when I've picked up my kids from their dad. We still have tree presents, but earlier, often with dessert and coffee. We can't go too late because my nieces have other family to visit. 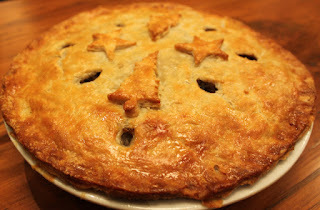 This year I'm going to try to revive one old family tradition, tortiere on Boxing Day. Since I'm making the pie, it may be a short-lived tradition.